The isolation transformer eliminates any electrical continuity between AC shore power and the boat. It is essential for safety and eliminates the need for galvanic isolators and polarity alarms. Safety is taken for granted in case of a normal on-shore installation. A fuse will blow or a GFCI (Ground Fault Current Interrupter) will trip in case of a short circuit or current leakage to ground. Connecting the ground wire of the shore-side supply to the metal parts of the boat will result in galvanic corrosion (see below). Bringing only the live and neutral wire on board results in an unsafe situation because GFCI’s will not work nor will a fuse blow in case of a short circuit to a metal part on the boat. Galvanic Corrosion occurs when two dissimilar metals in electrical contact are simultaneously exposed to an electrically onducting fluid. Seawater and, to a lesser extent, fresh water are such fluids. In general, the more active alloy of the couple corrodes preferentially while the less active (more noble) material is cathodically protected. The rate of galvanic corrosion is a function of several variables including area ratios, conductivity of the fluid, temperature, nature of the materials, etc. It is a misunderstanding that galvanic corrosion occurs only in metal and aluminium hulls. In fact it can occur on any boat as soon as a metallic part (the shaft and propeller) is in contact with water. Galvanic corrosion will quickly dissolve your sacrificial anodes, and attack the shaft, propeller and other metal parts in contact with water as soon as the boat is connected to the shore-side supply. It might therefore be tempting not to connect the ground conductor: this is however extremely dangerous because GFCI’s will not work nor will a fuse blow in case of a short circuit to a metal part on the boat. The best solution to avoid galvanic corrosion and at the same time prevent any unsafe situation is to install an isolation transformer to connect to the shore-side supply. The isolation transformer eliminates any electrical continuity between shore power and the boat. The shore power is fed to the primary side of the transformer and the ship is connected to the secondary. The isolation transformer completely isolates the boat from the shore ground. By connecting all metal parts to the neutral output on the secondary side of the transformer, a GFCI will trip or a fuse will blow in case of a short circuit. 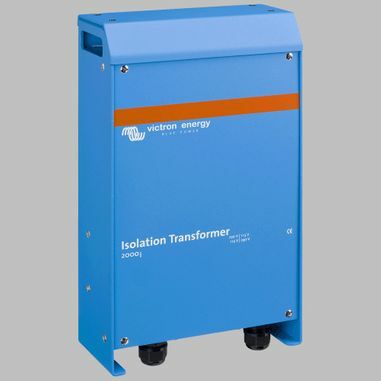 Soft Start Funktion is a standard feature of our isolation transformer. It will prevent the shore power fuse from blowing due to the inrush current of the transformer, which would otherwise occur. It is also recommended, for optimal safety, to connect the secondary neutral of the transformer to ground when the boat is out of the water.